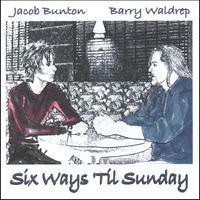 From Birmingham, AL, Jacob Bunton and Barry Waldrep have crafted their own blend of Bluegrass meets Rock and Roll. Growing up on different sides of the musical spectrum, their two styles have come together to create a sound of their own. A mixture of old time Bluegrass with the agressive approach of rock. This album is a must have for any fan of acoustic music. This is in my top 5 of all time favorite Bluegrass CDs. I love the hard driving feel of Gamblin' Man, and the more melodic strains of I'd Rather Be Home. You can't go wrong here. I love this CD. I love this CD. These guys can really play. My ten year old daughter keeps asking me to play it in the car over and over (she has awesome taste in tunes) I can't wait for a folllow up disk. Thanks guys.